The burgeoning trend amongst automakers today is to focus on zero emission vehicles, better known as electric vehicles since they have, wait for it… zero emissions. Automakers have boasted these cars’ lack significant lack of a tailpipe with accompanying subliminal messages of polar bears running freely, econauts being generally happy while dancing, and of course cash savings, but that’s not so much subliminal as it is obvious. Setting off is a matter of holding down the gear switch till drive (D) appears on the dash. It’s a soundless operation mechanically, while indoors a beep lets you know you’ve got drive to the wheels. It pulls away quietly from a stop; there’s no motor noise, no tire squeal, no drama at all. That remains the case even if you’re at your local drag strip, jamming the accelerator deep into the foot well to maybe yield a respectable ¼ mile time. You’ll be very embarrassed, with your manhood slightly shrunk from all that adrenaline not rushing to where it should. 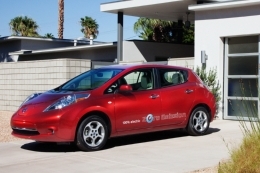 The 0-60 tests on the leaf have given a wide margin ever since it was first allowed for civilian tests back in 2008. There were reports of people claiming 5 seconds, while some received further off figures like 12 seconds. By now, the public has settled on 7 seconds. My GPS verified 0-60 figure was 12.32 seconds, with three adults loaded. With the curb weight tipping at around 3500 lbs (~1500kg), the total weight at the time would have near 4000lbs, and that’s a bit much for 107 tamed stallions. It makes up for it with nearly twice the torque, and more than compensates for that poor first impression off line. Had I been the only one in the car, it would have done 7 seconds very easily. My first question to a Nissan PR manager riding shotgun was, “can I drive it fast?”, to which he replied, “absolutely!” It was a bad idea they had an autocross-style course set up first, because I really did expense a third of the battery life and about half the tire tread on that run. The Nissan Leaf has thin, Dunlop Ecopia tires which have a small seasoning of tire tread sprinkled on for barely any hint of control. Taken through the corners even slightly fast, and it results in understeer… a lot of understeer. It was a dry, hot day, and the tires could barely keep the 3500lb chassis in check. At one point, the rear tires lost composure causing a major upset in balance, at which point I tapped the brakes only to awaken a terrified ABS module. A tap of the accelerator in the same fashion results in the inside tire spinning hard from all that instantaneous torque. You end up a small, fat car trying to dance its way through a few cones. Which it can’t do. This Looney Toons episode was all at UNDER 25 miles per hour. Driven any quicker, and I have no conviction in saying that it would have rolled. It simply cannot handle a quick maneuver. It’s a high center of gravity, a massive floor-mounted lithium ion battery pack, and low resistance rubber. Far from the perfect combination for a controlled ride. y conscious crowd who are idiots not familiar with a good car interior. Much like the outside, the inside is ugly. It’s boring, plastic, uninteresting, and only utilitarian. The only interesting bit about the inside of the Leaf is its touch screen navigation system, with Bluetooth, an MP3 player, and an average sounding set of speakers. The Bluetooth worked fine, the navigation would have guided me to a route of less than 97 miles, and the FM Radio played through the aforementioned average set of speakers. There’s space inside for five adults, had one sat in the trunk. Which he did. The Nissan Leaf is an appliance and will only be bought by ill-informed consumers who’ll buy into the tax breaks and fancy marketing ploys. The electric vehicle movement is a fad, one that is being perpetuated by the government to only wean us off fossil fuels. And while I gladly embrace the thought of never having to put a drop of gasoline in my tank ever again, I won’t do so if the alternative is something as horrible as this. As a person who is deeply passionate about cars, I will not buy into the EV marketing because we, as men who understand cars, know that an electric car leaves a heavier environmental footprint than a conventional internal combustion engine. It leaves the automakers’ marketing efforts redundant as their claims of green-light thinking, and rosy subliminal messages hold no weight. The Nissan Leaf and Chevrolet Volt have both sold less than 400 units each since their introduction. Can a desi dude fit in the trunk?